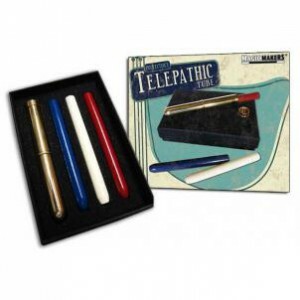 Removed from a black box is a brilliantly polished brass "Telepathic Tube" and cap with a red, a white, and a blue rocket. The performer, with his or her back turned, asks their spectator to take one of the rockets and place it into the tube, close it with the cap, leave it out on the counter, and place the remaining rockets into the black box with its lid covering. The performer can then, using telepathy, tell what color rocket is inside without seeing inside the "Telepathic Tube" or the black box. Is it real telepathy? The gimmick is so good, yet simple and easy, that it even fools magicians... Everything is included with this collector's limited production apparatus.